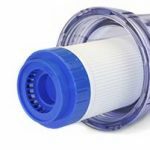 Are you looking for a reverse osmosis water filter? Since the emergence and introduction of Reverse Osmosis water as a home water purification system, it has grown widely, among almost every home as today. In case you wonder what RO is, it’s a technological way of removing particles, molecules and ions commonly found in the water by using its semi-permeable membrane. Osmosis is a phenomenon where pure water flows from a dilute solution (medium of lower concentration) through a semi-permeable membrane to a medium or higher concentrated solution. If the pressure is greater than the osmotic pressure applied to the higher concentration, the water flow direction through the membrane can be reversed. Small molecules and ions will pass through the membrane to dissolve substances present in the water. A greater pressure than the osmotic pressure applied to the high concentration will flow the water channel through the membrane to be reversed. This reversed flow produces clean, tasteless pure water from the salt solution since the membrane does not allow the passage of salt through it. 1. For health reasons, it is beneficial to use water filters to drink clean waters. 2. In developing countries where recycling is rampant, it is highly recommended to use a water filter in your home to avoid the spread of epidemic diseases. 3. The popular use of bottle and sachet water as a solution to replacing tap water is a wrong idea due to the plastic container. 4. Bacterial contaminants can escape the guarded treatment of water in public water facilities. 6. RO water filter, it will improve mental, physical and overall health. 7. It provides clean and healthy drinkable and cooking water. 8. In the long run, it costs less than bottled water. 9. It reduces the exposure to gastrointestinal diseases by removing Cryptosporidium from drinking water. 10. It will help build stronger immune system in the body especially in children. 11. The use of this water filter helps to remove the presence of lead (Pb). 12. Water becomes better tasted than any other form of preservatives as it removes chlorine and any contaminated bacteria. 13. Having RO, it stands as a barrier between the water and the consumer. A sieve for purity at just a press of a button. 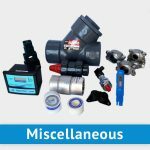 For any inquiries regarding our reverse osmosis water filter products or parts and full components, we have various products land-based, marine products, industrial products and diverse brands with innovation and high-tech controls at SEA-RO. With a single click, get access various products for your services on our homepage. Call 954-527-5282.